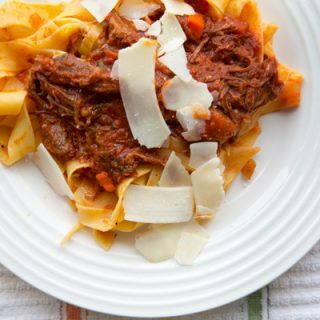 Whether you use wild boar or a pork shoulder you'll love this easy to make recipe for your slow cooker. Over the course of the last year, I’ve done my best to eat healthier. That means reading labels and switching over some of the foods I’ve been eating all my life to healthier versions. There’s a lot of confusion over labeling, especially when it comes to the meat industry. Phrases like Cage Free, Free Range, All Vegetarian Diet, and even the word Natural rarely tell the true story. Even the certification labels that the self-governing divisions of the meat industry uses are simply meant to confuse us and are nothing more than decorations on the packaging. And the importance of the food we eat is paramount. It seems these days that the only distinction used by the meat industry that hasn’t been perverted is Pastured. Pastured animals graze for their food the way nature intended and responsible ranchers know when to add grains to their animals diets to supplement their food supply. So when I found out about Wild Boar and Bison as an alternative to traditional meat supplies, I thought I’d give it a try and give my honest opinion on the product. 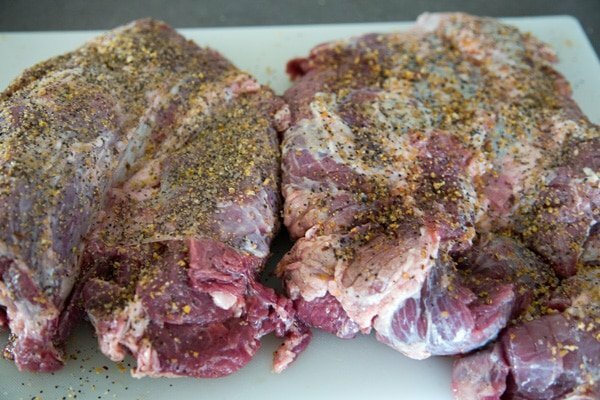 I started out with a wild boar shoulder roast, un-netting the roast and splitting it into two pieces that would fit into my slow cooker. Then I coated the roast with a little olive oil and a liberal amount of Montreal Steak Seasoning (Sea Salt and Black Pepper would work also) and seared on both sides in a large frying pan. The Mire Poix that went into my slow cooker before the roast was simply, carrots, parsley, onions and garlic cloves. If my garlic looks a little funny I clean my cloves then store them in Olive Oil in a jar until needed (when I feel inspired enough to clean a bunch of garlic) and real olive oil will always solidify when refrigerated. I added a few additional ingredients and set the timer to slow heat cooking, with a time of 7 hours and went about my day. I was rewarded with fork-tender meat that tasted like pork should taste. 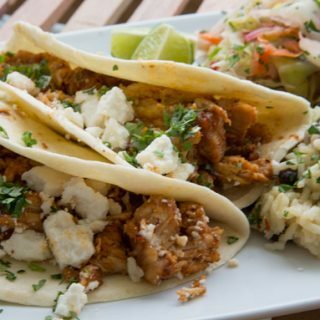 No gaminess, no unusual flavors…… just pure unadulterated pork. To make the meal even better I broke out two bottles of Uncle Matty’s Premiere Sauces, Matt’s one of my local friends and he makes some of the best sauces, I’ve ever had! Check out his products at Uncle Matty’s Food Co.
All I could think about was using that delicious wild boar in pasta sauces and mouthwatering sandwiches. I didn’t have long to wait and lunch the following day was glorious! 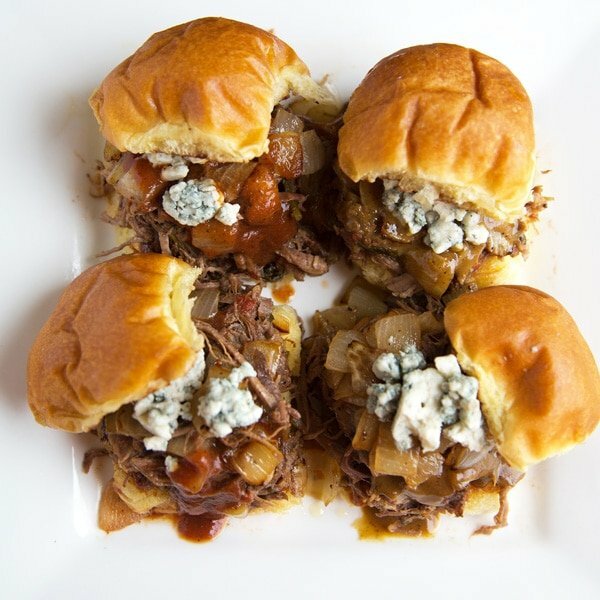 I made wild boar sliders with caramelized onions, bleu cheese and Uncle Matty’s Sauces. And yes I ate all four of them……. I loved responding to friends asking what restaurant I was at so they could partake in those sammies! I see a restaurant meet up at the Chef’s House! If you’ve never used a slow cooker, it’s a lot easier than you think. I cooked the whole shoulder roast (about 6 lbs) without any worry or having the oven heat up the house all day. Since the roast was more than Lisa and I could eat at one time, I broke it up into manageable pieces and froze them in ziplock bags. Now I’ve got gorgeous tender pulled pork, ready to use whenever the craving hits…. I see a Wild Boar Ragout in my near future! Heat a large saute pan on your stove top and when pan is very hot add a little olive oil and sear both sides of your roast. 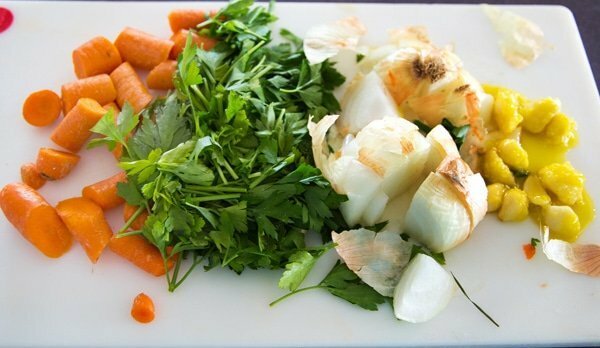 Place cut veggies and garlic in bottom of your slow cooker. Add the roast, bourbon, brown sugar and diced tomatoes. cover slow cooker and cook on low for approx. 7 hours. 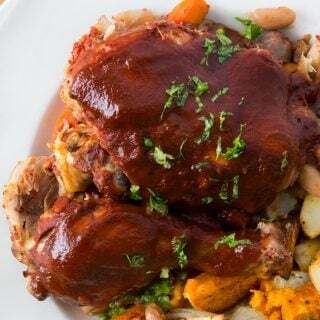 The sauce that is in the bottom of the slow cooker should be strained and placed in a small sauce pot, reducing the liquid by half over a medium - high heat. 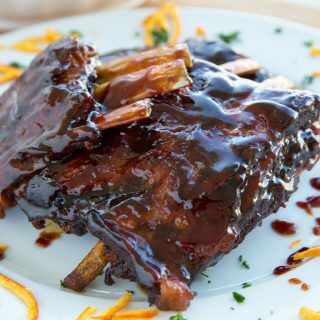 Serve the wild boar in pieces, encouraging your guests to pull it into pieces dipping it the sauce that came from the slow cooker or your favorite sauces. It was really good and already remaking it a second time. We have legs that we wanted to cook first as opposed to the other boar cuts in our freezer. We saw in your reply to someone else that it could work and gave it a try. After shaving the meat off the bone, we yielded 3.6lbs. We opted for red wine because that’s what we had on hand from another dish and kept to the recipe. We checked the meat after 5 hrs and it wasn’t pulling like we wanted. We went for the full 7 but checked after an other hr. The full 7 hrs was perfect and a big hit for our play date – 2 adults and 6 kids. Wife grew up on NC Lexington style bbq; but for not pulling out the smoker, this is a keeper. Great Recipe…Only thing I added was chopped celery. Thanks for sharing, my son and I do a lot of hunting and love wild boar and are always looking for a new way to serve it and everyone loved it. Can I add some more liquid to this recipe because I added cut small potatoes?? Hi, curious why to leave the skin on the onion? you’re not really going to use any of veggies in the pan since they will be cooked way too much. The skin is just to add some more flavor to the sauce. You can leave them out if you like. Can wine be substituted for bourbon? I have never had wild boar before so very excited to have been given it as well as deer meat and fresh caught salmon. What does the alcohol do in a recipe? Is it just to add flavor? Thanks for any information! Yes you can use red wine. It is really only for flavor and I often tell people looking for non alcohol recipes to use Root Beer, Ginger Beer or Dr Pepper. I have some great salmon recipes on my website if you’re looking for any. 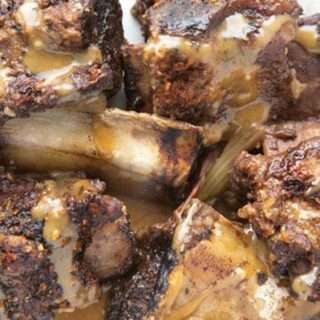 I recently had a successful boar hunt and tried this recipe. Excellent! Thanks Chef Dennis! Everyone loved it & I have several more roasts to make it again! Super easy & delicious! 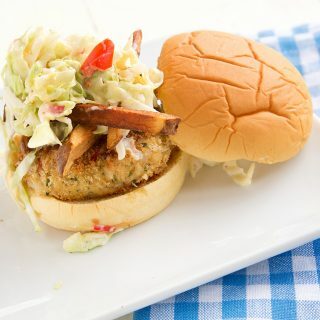 I’m very happy to hear you enjoy my recipe Shawn, thanks for the great review and comment! What can I use in place of the bourbon, since we have no alcohol in our home? hi Dianne- that’s an easy fix. You can use coke, root beer or Dr. Pepper in its place. All I have are the tenderloins…is that too lean for this recipe? Making this today but my roast is only about 2 lbs…. Do i need to adjust the cook time? Thanks! if you’re using a slow cooker I would probably cut the time back to 5- 6 hours on low since it is a smaller roast. 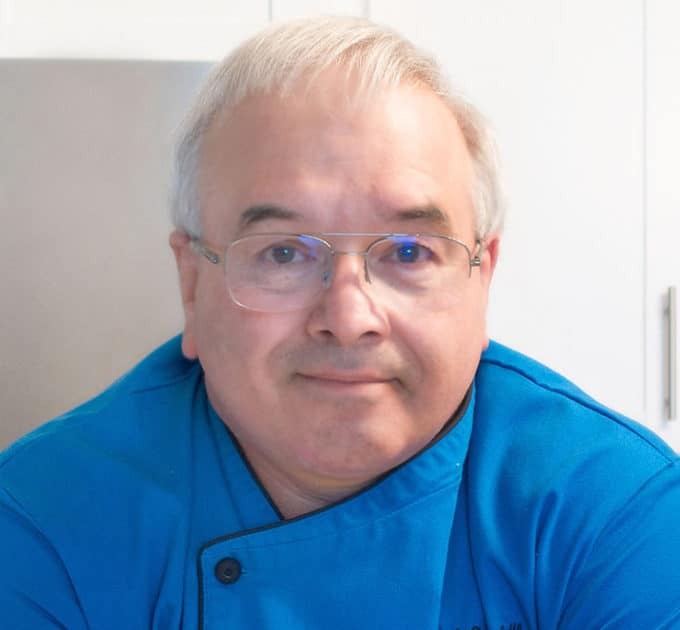 Thanks for this delicious recipe Chef Dennis! 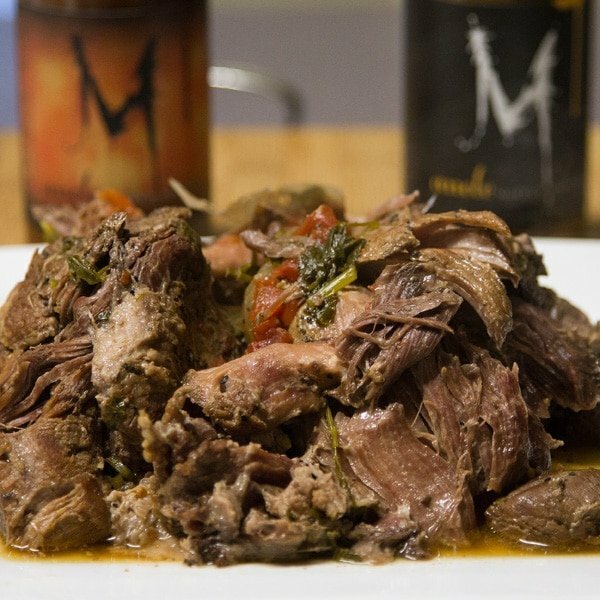 I recently used this recipe to cook a wild boar leg and chose not to use the Montreal seasoning; it turned out fantastic. Rather than making sandwiches, I made crushed potatoes and celery root purée to accompany the tender meat. The leftovers freeze well. I will definitely make this again and again! Thanks so much for letting me know you enjoyed my recipe Vicki!! Question I was given a wild boar leg (2 actually) can I debone it before slow cooking? My slow cooker isn’t big enough for the leg with the bone. thanks Toni! I’m lovin’ the wild boar!